Believe it or not but I actually used to live in Paris. That's right. From the age of five years old all the way until I was eighteen I was a Parisian. Just so you know I am talking about Paris, Illinois and not Paris, France. Just seeing if you were paying attention. 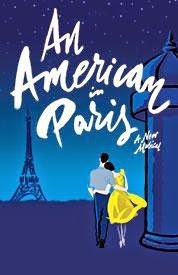 In case you didn't know it the Broadway production of An American In Paris is based on the 1951 film of the same name which won the Academy Award for Best Picture of the Year. Did you know that? I didn't.Oh sure I knew there was a movie before but that it won the Oscar too? I guess you learn something new every day. Now I have always been a huge Gershwin fan. Thankfully this new production has over sixteen glorious Gershwin tunes to choose from including, "I Got Rhythm", "They Can't Take That Away From Me", "The Man I Love", and of course the title song, "An American in Paris". Does it get any better that that? The show which premiered in Paris last fall is set to open at the famed Palace Theatre tomorrow night. If the Paris reviews are any indication we might just have a big fat hit on our hands. Fingers crossed. By the way for those of you who want tickets to see An American In Paris you are in luck my friends. We sell them. Not only that but if you call right now you can get tickets at prices that can't be beat. Be advised that while this "Special Offer" is good thru June 7 it is not available on May 23 or 24 and as always subject to availability. Get your tickets to see An American In Paris on Broadway at the Palace Theatre. You will love it. Until next time theatre fans.